Dung beetles have this really neat trick by which they’re able to use the positions of the stars to orient themselves along a straight line, making them the only known animal to use the Milky Way for navigation. Exactly how they do this has remained a mystery—until now. 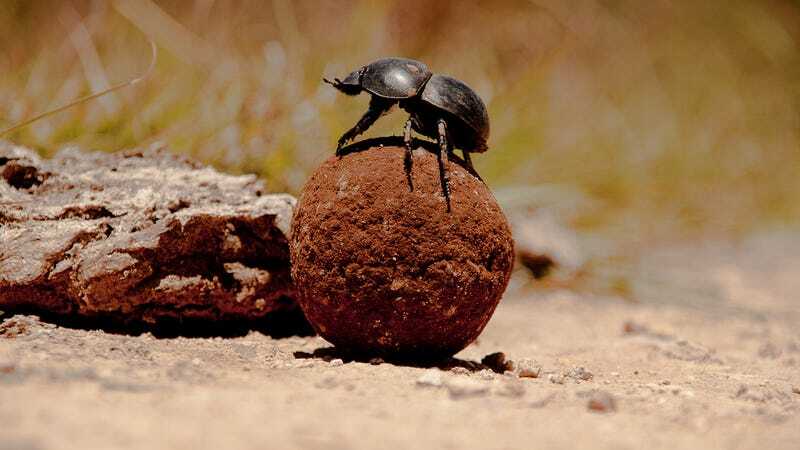 For food, dung beetles famously detach a chunk of poop from a pile of dung, then shape it into a ball and roll it away. To protect their meal from competitors, dung beetles have to make their getaway as quickly as possible—and even these insects know that the shortest route between two points is a straight line. Accordingly, dung beetles relocate their precious balls of poop by rolling them in remarkably straight lines. A few years ago, researchers from Lund university showed that dung beetles rely on an internal compass that orients the bug according to the positions of the stars and Moon. A follow-up study showed they even use the thick band of the Milky Way for navigation. But the mechanism that enables them to use these stellar cues remained unknown. Now, this same team of dung beetle-obsessed researchers say they’ve finally figured it out. These insects are able to look up into the night sky and take a “celestial snapshot,” which they store as a map inside their brains. The research now appears in Current Biology. To demonstrate this, a research team led by Basil el Jundi experimented with dung beetles in simulated conditions. Instead of exposing them to the real world and the real night sky, the researchers created an artificial firmament. They were able to mess with the dung beetles by regulating the amount of light and by changing the positions of the celestial bodies. This allowed the scientists to compare how the beetles were compensating and potentially altering their trajectories based on the placement of the artificial stars and Moon. Despite these simulated conditions, the beetles were still able to orient themselves. This research shows that, even if the night sky represents a physical impossibility, dung beetles are still able to maintain their bearings—but only if the stars, or cues, are still visible when the snapshot was initially taken. When the stars were removed or altered, the dung beetles were out of luck, and their orientation skills suffered accordingly. Tellingly, a similar effect happens to them in the real world when the sky becomes overcast. Very cool, dung beetles, very cool.